Onions. Fish. Garlic. Chilli. Great in a fresh recipe, not so great as lingering smells in your kitchen. Having a good kitchen extractor fan can be what rescues your home from smelling stale by keeping your air clean and fresh. If smell is the strongest sense, then who wants friends or family walking in to your home and sniffing out last night’s dinner! Not only are these fans great for clean air, but they can be a key part of what ties your kitchen together. A modern, sleek looking fan is a subtle centerpiece. A good one can make a quiet statement of welcoming quality for anyone lucky enough to be in your kitchen! If you’re not sure what to look for, I’ve also written a small ‘buyer’s guide’ at the end of this article. It covers the important features to look for in a good extractor fan (i.e. CFM, Ducted/Ductless, Features). I’m confident any of the following fans would be able to keep your kitchen happy for years to come. Honesty note – while we’re not sponsored by anyone; I do earn a small commission if I’ve helped you discover the best model for your kitchen. This doesn’t cost you anything: Amazon share some of their profit as a small ‘thank-you’. 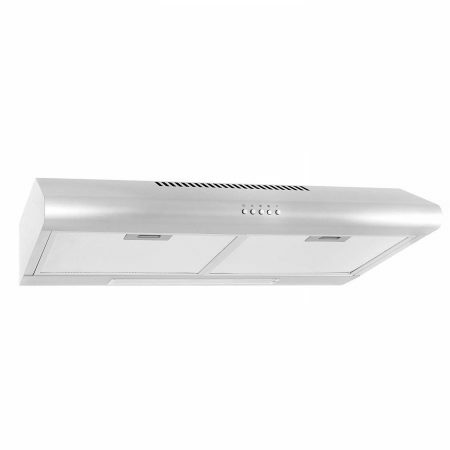 This chef under-cabinet range hood is my recommendation for the most powerful home extractor fan. It’s a beast – packing a (sucker) punch of over 850CFM through those strong looking grills. The touch screen controls bring an element of modernity that other powerful models lack. My favorite part, aside from the looks, is actually the lights. There’s 2 light settings! Perfect for making sure you can see what you’re doing or just admiring how good your latest recipe is looking. If the 3000k bulbs aren’t strong enough? They’re super easy to replace with stronger bulbs (or if they break). Easy. If you’re an avid cook but hate leaving your kitchen with lingering smells, this may be the model for you. Powerful without looking beastly, this Chef model is a fantastic choice to provide looks as well as functionality. Plus, with replaceable lights that use two settings you can be sure you can always see what you’re doing. Pretty helpful when you’re trying to get those eggs just right! Just make sure you’re okay with ducted; as there is no ductless option available. If you’re looking for a modern kitchen extractor fan which doesn’t break the bank – then this is the one for you. It’s super slim. Less than 6 inches tall, slim. Leaves you with a ton of space, slim. The stainless-steel finish gives it a design suited for any modern kitchen. Combined with the 5 push-button controls, it’s an all-around satisfying design. Designed with usability in mind – the reusable filters are dishwasher safe. Plus, being both ducted and ductless means it can work in any home. The satisfaction of a push-button helps forget that it’s not touch screen! All of this for easily the lowest price tag on this list. It’s incredible value for money. The downside, however, is that value comes with a downgrade in power. While 200CFM is enough to get the job done, any extra strong scents may take a while to be taken care of. and a 5 year warranty! It’s an easy recommendation for anyone budget-minded with a smaller kitchen. Note! There’s also a smaller, 30” wide version available on Amazon here. For all you bargain hunters out there – he’s what I think to be the best offering. This Broan model is no frills – simple switches, simple look, not a ton of power, and a price tag to match. That being said, it’s far from useless. Have a small kitchen or not much of a chef? Read on. This model is actually the ‘best selling range hood’ on Amazon.com. While it doesn’t pack a punch, the value for money is great. The unique looks will never fail to be a talking point, and setup is reportedly super simple. If all you want is a cheap kitchen extractor fan that looks good and does the job, here you are. Another interesting plus point is customization. There’s a whole bunch of width (21 to 42 inches!) and color (7!) options. Combined with the unique look makes for plenty of character – and not in a bad way. Everyone loves a bargain. Especially with the confidence of knowing it’s a bestseller. Easy setup, easy on the budget, easy on the eyes. If you’re not one for needing a ton of power or looking like your kitchen’s from the future, this is a genuinely solid option for your kitchen. Be aware this model is ductless only! If you’re lucky enough to have some high ceilings, you’ll want to find the best extractor fan with a chimney. High ceilings mean a lot of air room. So you’ll want a good amount of power. And having a chimney means the fan will be a main part of the room. You’d probably want it to look good too, then! If these are the case for you, then I’m proud to recommend this Golden Vantage model. You can see the pros below for yourself – personally I found it to be a great all-rounder with a fantastic look. 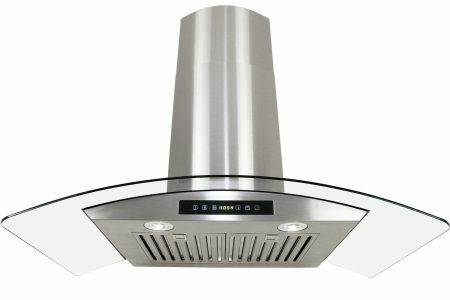 The sleek touch-screen, euro-style glass, and stainless steel chimney can act as a centrepiece in any modern kitchen. With 380CFM and designed for a quiet operation, ticks so many great boxes. The 3 year warranty doesn’t hurt, either! The chimney is good for up to 8-foot high ceilings, and the air filters are – of course – dishwasher safe. In all honesty this is an example of a great extractor fan which ticks all boxes. Good warranty, good power, great looks (controls and exterior), and a more than fair price tag. If you’re looking for a great deal that will fit your higher ceiling, there aren’t many that come close to this Golden Vantage model. 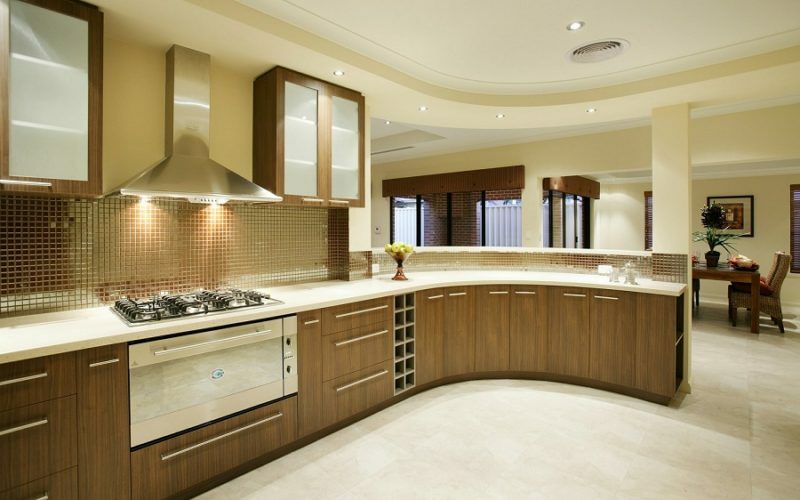 What are Kitchen Extractor Fans? These appliances consist of a (hopefully) good-looking exterior housing mechanical fans above your stove/cooktop. They act to remove fumes, smoke, heat, steam, and airborne grease from the air in your kitchen. In professional kitchens, these fans can even be strong enough to be used as part of a fire suppression system! They can also be combined with an intake fan to bring in fresh air. What happens to the air? There’s two major types of these appliances – ducted (vented), ductless (recirculating). Ducted includes a blower motor which funnels the air through ducts and outside the building. These remove everything, including any germs that could get through filters. This means it doesn’t need filters. Which means no filter cleaning! And also means no loss of power by having a filter in the way. Plus, by taking out the hot, smell-filled air from the kitchen, it also brings fresh, clean air from the outside back in. On the other hand, ductless uses filters to remove odor and smoke particles and recirculates cleaner air back into the kitchen. They’re super easy to install, cheaper, and are practical for any size of kitchen. That said, they’ll not be as efficient or give you that outside air to keep things fresh. If you go ductless, just make sure you clean the filters monthly. Makes sure you’re preventing the filters/ductwork being clogged and unusable. How do you clean the filters? Any good extractor fan will come with filters to trap airborne grease. These can get very, well, greasy if not cleaned for a while! A lot of what I’ve analysed the extractor fans on is based on their power – measured in CFM. This is simply ‘cubic feet of air per minute’. The more, the better! Higher power/CFM is great to clear up stronger smells or cover a wider area. However, it often comes at a greater cost in both dollars and in noise. What are the best features to get? As with any modern appliance, there’s a huge variety when it comes to features. Generally, the better the features the higher the cost. There’s also a few that are only on the expensive models that don’t really justified the cost (i.e. thermal sensors). That said, I’ve listed out most of the flagship features of modern extractor fans. Take a look, and see what’s important to you. Kitchen extractor fans are nothing to underestimate. The combination of fresh, clean air and a great looking kitchen centrepiece can really make a huge difference to the way your kitchen looks and feels. It’s one of these appliances that really ties everything together. That said, it’s important to get an extractor fan that suits you. Suits your needs, and your kitchen. I hope that at least one of these few on offer will be the appliance that’ll be right at home in your kitchen.